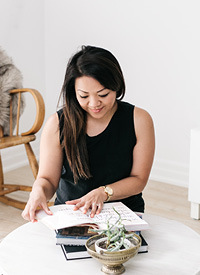 Spun Studio + Giveaway — Love On Sunday Love On Sunday | Interior Styling in Toronto and the GTA. A couple of months ago, I was contacted by Lindsey Thomsen from Sistering. She wanted to know if I would be interested in joining a design team that would focus on creating handmade products for a special fundraiser. A fun project in support of a worthwhile organization? Yes please. I knew it would be a great opportunity that I couldn't pass up. Sistering provides services for homeless, low-income and marginalized women. They have created an environment where women can gain job skills and be part of a welcoming and supportive community. I thought this would be the perfect opportunity to do what I love and also give back to the community. I've always had a love for handmade goods so I felt this was right up my alley. Inside the walls of Sistering you can find Spun Studio - an room filled with 2 weaving looms, tons of fabric and uber talented women. The studio teaches women how to sew, knit and develop business skills. I will never forget how I felt when I walked into that studio. Like a kid in a candy store. To see a loom in action is so fascinating to me. Below is a sneak peek of my design that will be sold at the upcoming fundraiser. Any guesses? I can't give it away, so make sure you come to the event to check out the goods. Also, below are the other talented ladies who will be showcasing and selling their designs. 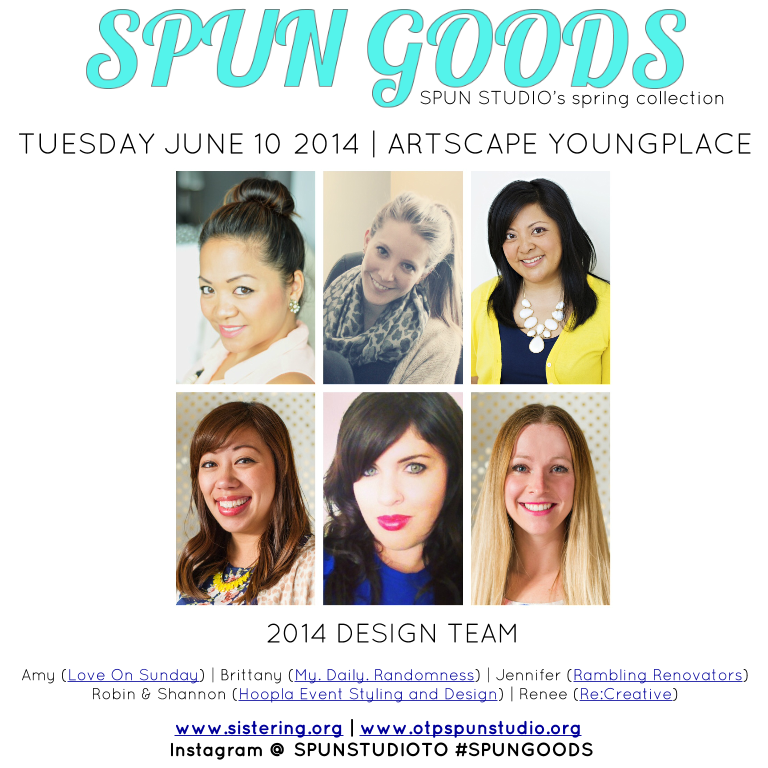 Come see us on Tuesday June 10 from 6pm - 9pm at Artscape Youngplace. A big thanks to Lindsey and the ladies at Spun Studio for inviting me to be part of this special event and helping me bring my ideas to life. Also, a big shout out to Tonic Living for your generous fabric donation that will be used for my products. You can purchase your tickets here or win 2 tickets by simply leaving a comment below, stating your favourite handmade product. Super easy. Contest closes on Saturday May 31st. If you want more chances to win, make sure to check out Britt's giveaway here. And if you are unable to attend the event, feel free to donate directly to Spun Studio.